We have a large selection of lighting, effects and projection options for any type of event. 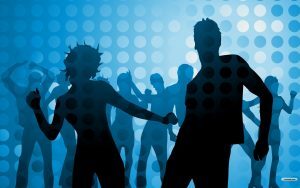 Whether you are looking for a simple setup to enhance the dance floor, or an over-the-top club experience, we’ve got you covered. Our equipment includes scanning lights, lasers, fog/hazers, LED effects, professional blacklights, strobes, mirror balls and par cans. We can mount our lights on simple “T” stands or on a large light truss 15 feet in the air. We can set up front and rear projection options that allow us to project additional sound-reactive effects for shadow dancing. 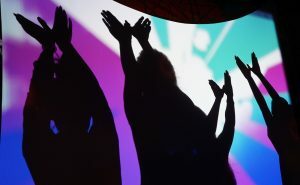 Our interactive projection options allow guests to move items on the projection screen as they dance. This effect is very popular for school and youth events. We can also set up bubbles, artificial snow or foam if your event requires these effects. Contact us to discuss these options so we can give you details and answer your questions. 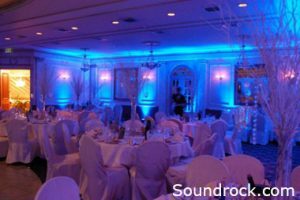 We offer LED uplighting to enhance the aesthetics of any room, tent or outdoor venue. Uplights add custom color through indirect light. They look amazing indoors or in tents and they can also highlight trees or buildings outside. Our fees for lights, effects and projection range from free to $300 depending on your needs. Most premium packages cost around $200.